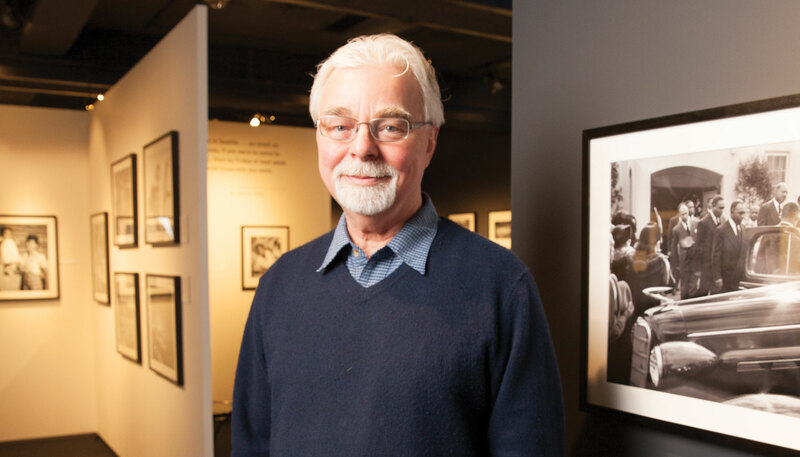 Howard Giske began working at the Museum of History and Industry in 1980. He became curator of photography in 1996 and retired in March. What exactly did you do? I acquired, cared for and shared wonderful historic photographs from all over Washington. Do you have a favorite photographer in the MOHAI collection? Al Smith. He was born in Seattle in 1916, got a camera at age 12 or 13, and never stopped taking pictures his entire life. A wonderful body of work has been ensured from Al’s dedication. What is it about Al’s work that you like so much? It’s sincere, genuine, strong documentary work that grew directly out of his life. As a young man in the 1940s, he was into partying and having fun and you see that in his pictures of nightclubs. Later in life, when he became a family man, he took pictures of his kids, his wife, his family, his neighborhood and his community. Al was the real deal. Does a particular picture in the MOHAI collection stand out to you? There is one that’s special to me. In the 1970s, we received a negative, dated May 1942, of a Japanese-American woman and her child standing on the Bainbridge Island ferry landing waiting for a boat that would take them to an internment camp. There are two baggage tags tied to the mother and child and when we printed the photo, we were able to see their names, Miko and Natalie Hayashita. Through the Bainbridge Island Historical Museum, we discovered that Miko was still alive and, eventually, in part because of this photo, Miko went to Washington, D.C., and testified before Congress to get some consciousness and compensation for that community. That photo and story are the perfect example of why MOHAI is here. Are you a “family photo album” kind of guy? Well, yeah, but not in albums. I have lots of raw material in boxes, like our wedding pictures from 30 years ago. That’ll be my retirement project. Uh-oh. Exactly. They were maritime pictures and this man was so excited to give them to MOHAI that he managed to drop all of them. I’ve never seen someone so distressed. You’re a photographer. Tell me about one of your memorable photo shoots. A real thrill happened in Bellingham in 1970. There was an event called the Multi-Arts Festival that featured poets, writers, artists and musicians from all across the country, and I got to walk around and take pictures. A number of my shots got published in Rolling Stone magazine, which was a big deal, but I was such a rookie photographer that I forgot to stamp the pictures with my name, so I didn’t get photo credit in the magazine. (Laughs.) Live and learn. Describe the feeling of looking at the actual print versus looking at the same image online. Oh, there’s a world of difference. You can hold a print, move it around in the light, take a loupe and a magnifier to it. … It’s a physical object of the time and from the time it was taken. Any R-rated material in the archive? Very little, maybe none. By the time a collection gets donated to the museum, it’s usually been vetted and sanitized by the family. Humans are the only animals that keep archives. What are we trying to hold on to? I think proof of humanity. Proof that we’ve done some things that we can be proud of or ashamed of. What’s the main driver in your life? My family and doing worthwhile things. How would you describe your relationship to money? It’s a necessity of life for sure, but I don’t sweat it. Is there a piece of advice you would give to your younger self? Be brave. Don’t be shy. Keep it light. Does anything make you irrationally angry? I lose it over inanimate objects that don’t seem to work well. Like Tupperware — those damn lids! You’re stuck on a desert island and can have one book, one record and one food. The book would be the Bible because I’ve never read it; the record would be J.J. Cale’s first album, Naturally; and the food would be anything with preserved lemons. Success — what does it look like? A retirement with no regret. What gives you joy? Free time.